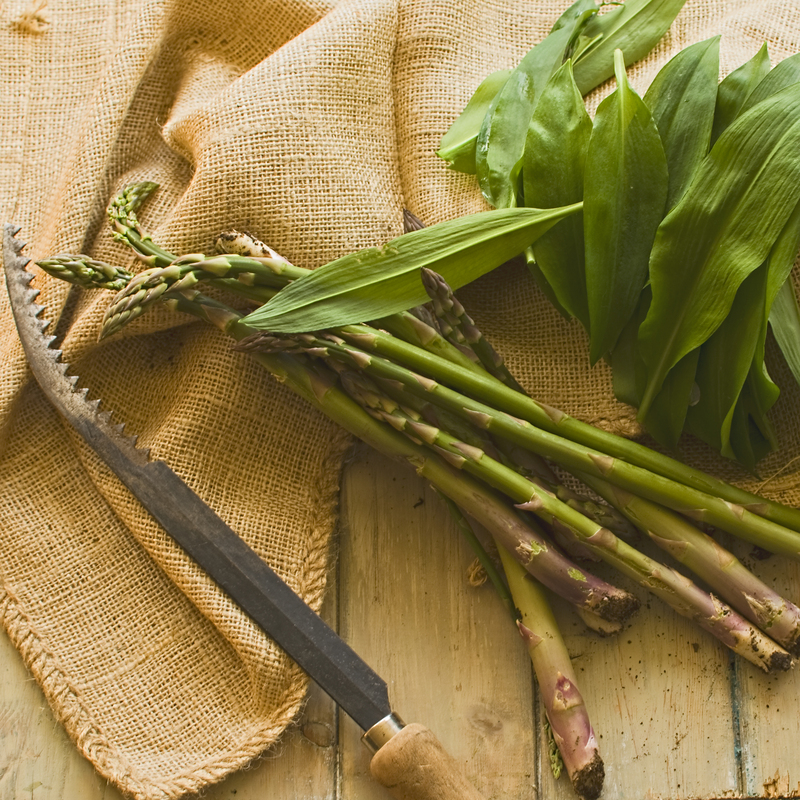 This week’s recipe combines two flavour-packed delights of early Spring, asparagus and wild garlic. Asparagus is at its best right now whereas wild garlic is already heading towards the end of its short but prolific season. 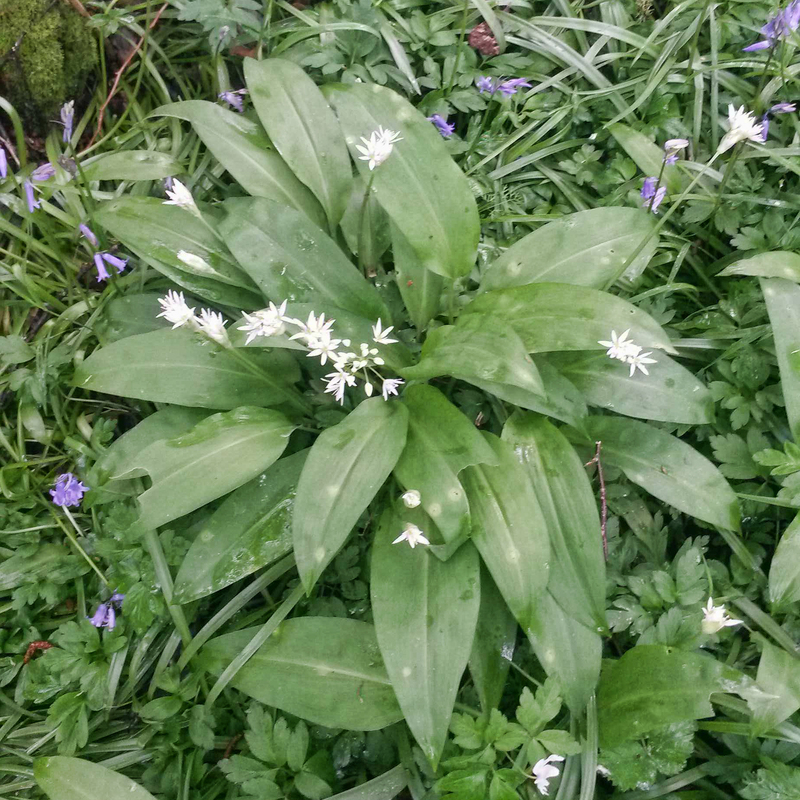 If, like me, you are fortunate to be able to forage for wild garlic locally, please only ever pick the leaves not the whole plant, and always take only what you need. On reflection, that ought to be a maxim that should apply to all of our interactions with food – “only take what you need” – because between us we do waste a shameful amount of it. According to a 2010 report commissioned by the EU, food waste occurs at four key points of the food chain, and we consumers are the biggest offenders. These figures surprised me when I first came across them as they suggest that a staggering 79% of all food waste occurs at the two ends of the food chain – production and consumption. How come so little responsibility for food waste is laid at the door of the supermarkets and retail sector – just 5%? Well, delve a little beneath the headline statistics and what you find is that they are responsible, indirectly, for much more than that 5% attribution. The supermarkets are in fact very efficient in “dumping” their responsibility for the problem of food waste onto both consumers and growers and manufacturers. For example, a significant proportion of the waste attributed to the growers is actually due to loss through so-called “out grades”. These are foodstuffs, such as misshapen fruit and vegetables, which are not deemed cosmetically acceptable by the supermarkets. Because they never make it onto the supermarket shelves, the “blame” for this proportion of overall food waste is transferred to the grower and therefore reflected in their food waste statistics. At the level of the individual consumer, food waste is mainly down to the fact that we tend to buy too much, cook more than we need and leave food in our fridges and cupboards beyond its “sell by” and “use by” dates. Whilst we each must take responsibility for our own profligacy, some of the food waste attributed to us individual consumers is surely fuelled by supermarket initiatives such as “buy one get one free”, which tempt us into buying more than we need. Then there is the problem of the way supermarkets package their food products, which often forces us to buy more of a particular foodstuff than we actually require. Finally, overly cautious adherence to “sell-by” and “use-by” dates often means we throw away perfectly edible food. Again, these elements of the food waste statistics are transferred to the consumer by the supermarkets via our shopping baskets. In a surprise but welcome move Tesco recently stopped its “two-for-one” offer on bagged salad after it was shown that 68% of it ended up being wasted. The same supermarket also said it would be “working with our suppliers to try to cut waste at all stages of the journey from farm to fork“. I am far too cynical to applaud this gesture unreservedly but neither am I dismissing it out of hand. It might just be a sign that supermarkets are capable, after all, of being shamed into accepting their true share of responsibility for the scandal of food waste. On my allotment plot, the Circus Garden, that harbinger of the new growing season, asparagus, has been thrusting up lots of delicate shoots for several weeks now. 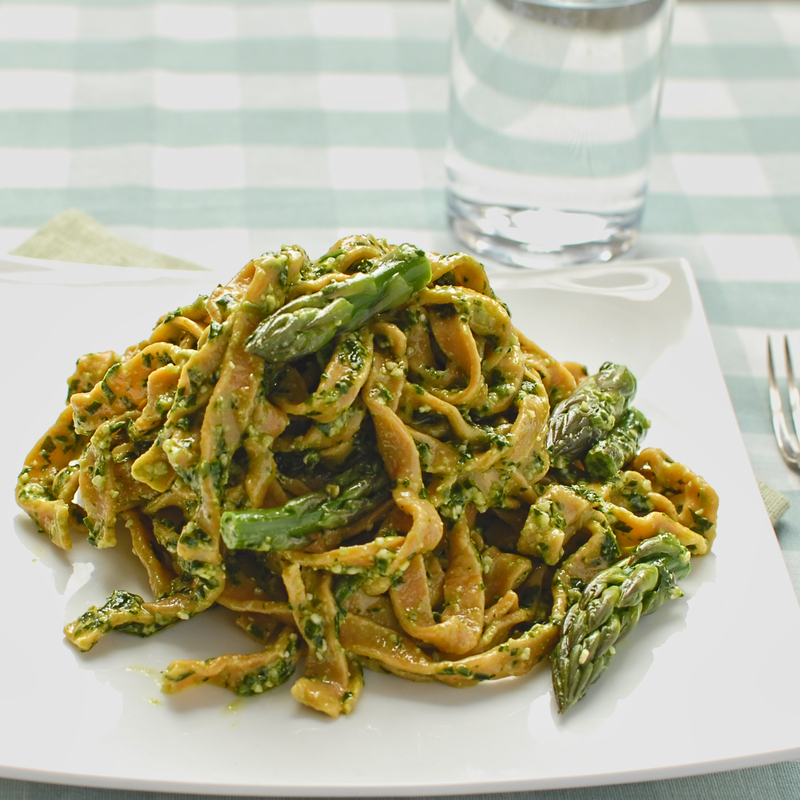 This recipe combines some of that tender, juicy asparagus with a punchy wild garlic pesto and a home-made smoked paprika pasta. The pasta provides a smokey warm component to pull all the flavours together into a robust and satisfying dish. 1. Remove any woody stems from the asparagus (do this by holding the asparagus spear in one hand about two thirds of the way down from the delicate tip. In the other hand hold it near the base. Gently bring your hands towards each other, bending the asparagus spear until it snaps. The lower portion is the woody stem and should be placed in your compost recycling). Steam the asparagus for 3 minutes then plunge into ice cold water to arrest the cooking process. Drain and cut into 2-3 cm pieces. Set to one side. 2. 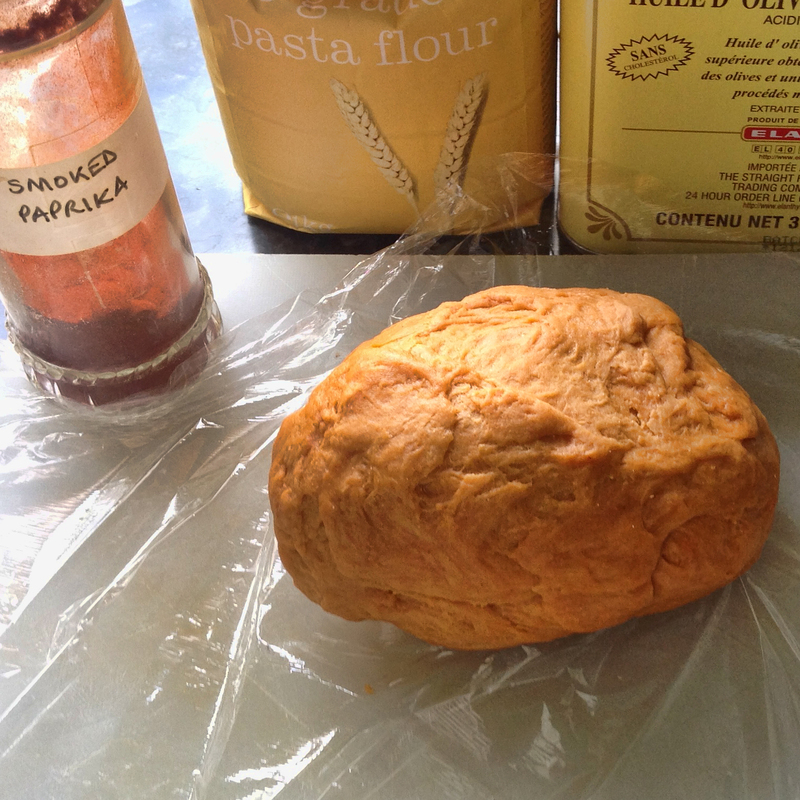 For the pasta, place the eggs, egg yolks, olive oil, flour and smoked paprika in a bowl and mix to a smooth dough. Knead the dough for around 10 minutes, until it is pumpkin orange in colour and firm but slightly elastic in texture, like a large lump of playdough. If necessary add a few extra drops of olive oil during the kneading process, but err on the side of caution. Wrap the dough in cling film and refrigerate for 1 hour. 3. For the pesto, place the wild garlic leaves, pine nuts, Parmesan and lemon juice in a food processor and blend to a fairly smooth paste. Add the olive oil and process again to combine. Set to one side. 4. Now to make the tagliatelle. Halve the dough and roll out each piece into a thin rectangle. Using a pasta roller, feed the pasta dough through the machine at its thickest setting (setting number “9” on my machine). 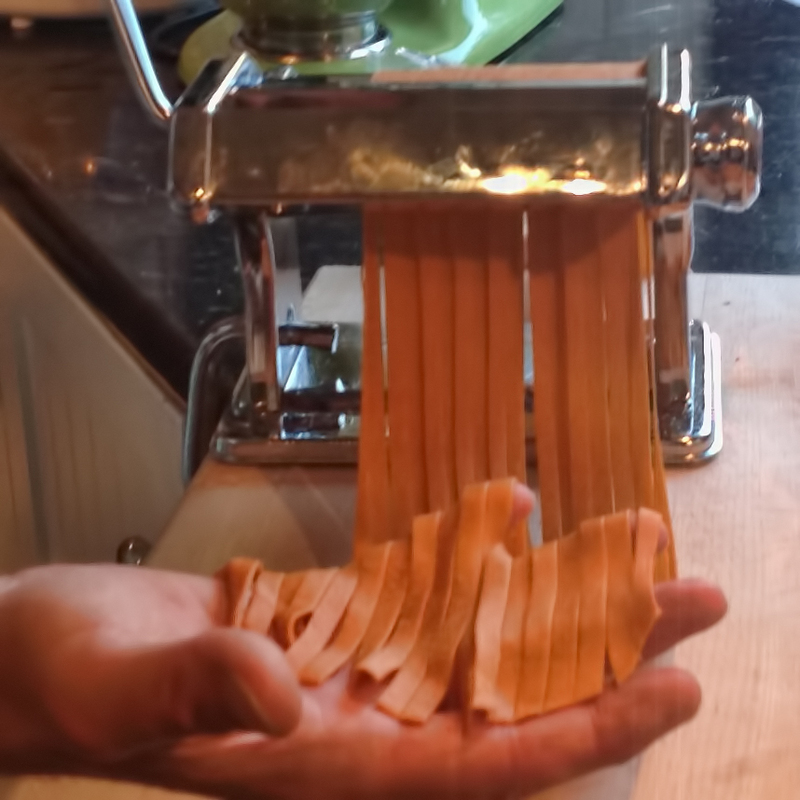 Repeat this several times, gradually reducing the setting until you can put it through on the thinnest setting and the pasta sheet has a smooth sheen. Now feed the sheets of pasta carefully through the tagliatelle shape cutter. Carefully gather the tagliatelle strands and place them on a baking tray along with the semolina. Toss to ensure the tagliatelle strands are lightly dusted with semolina. This helps prevent them sticking together. 5. Cook the tagliatelle in boiling, salted water for 3-4 minutes (putting salt in the water is very important – it imbues flavour but also helps ensure a good texture to the pasta). Drain. Add the asparagus and the wild garlic pesto and stir to combine. Serve immediately, with grated Parmesan. There’s an interesting article on food production here – http://www.huffingtonpost.com/george-naylor/national-geographics-five_b_5290883.html … you’ve probably seen it already. I like that he points to the low price of food as a key reason for wastage – who is going to value something that is so cheap and easy to obtain? Thank you for your comments and for the link to the excellent Huffington Post article, which I hadn’t come across before. The author, writing from experience as a farmer, provides a stark and intelligent assessment of the problems we will soon face trying to feed the world from a precarious and unsustainable food production system which, at its heart, places so little value on the food itself. Looks incredibly yummy! Can’t wait to give this a go!